1. Heat 1 tsp of oil in large saucepan over med-high heat. Add the corn and cook until the corn starts to brown (5 min stirring frequently). Transfer and set aside. 2. Heat 1 tsp of oil over med-low heat. Add onion and 1/2 tsp salt. Cook and stir for 8-10 min. 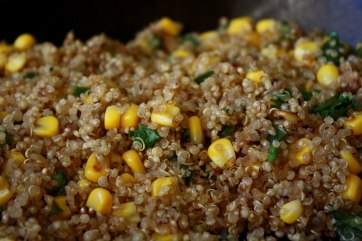 Add the quinoa, increase the heat to medium. Cook and stir for 5 min. 3. Add broth and jalapeños, bring to a boil. Cover and simmer on low for 16-18 min. 4. Let it sit for 10 minutes then add the corn, cilantro and lime juice.